This saddle is a great all in one saddle for all of your eventing competitions! The elongated, classic look will be a hit in the dressage ring, while the squared off cantle and close contact seat will be perfect for jumping and cross country alike. Was $499.99 Now $199.99 Scratch & Dent Floor Model Sale! May Have Cosmetic Imperfections - Price Reduced. 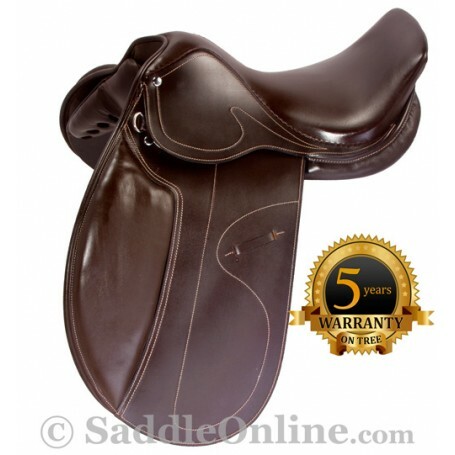 This saddle is a great all in one saddle for all of your eventing competitions! The elongated, classic look will be a hit in the dressage ring, while the squared off cantle and close contact seat will be perfect for jumping and cross country alike. This saddle is an eye catching deep brown color featuring a light, Euro-styled stitching to add detail and elegance to the design and the deep seat aids in rider comfort and stability. The soft padded knee blocks maintain a long and secure leg position without sacrificing comfort. The wool flock paneling and reinforced tree will ensure a comfortable ride for your horse as well, eliminating pressure points and providing freedom of shoulder movement whether you are on the flat or over fences. Gullet: 6.25” Medium tree. Will fit most horses.